Not to be confused with Slot Block. A glass, yellow or blue block that has constant changing items inside it. Releases the item shown on it when hit. Roulette Blocks are types of blocks first found in Super Mario World. They are blocks that contain items that scroll in a roulette. The item the block displays while the block is hit is usually the item that comes out. In Super Mario World, a Super Mushroom, Fire Flower, Cape Feather and Super Star can come out of a Roulette Block. However, once Mario or Luigi releases the item out of the block, it bounces around like a Star, but it still cycles from power-up to power-up. Mario or Luigi can grab the power-up at the right time to obtain that power-up's effects. Yoshi can also eat the item straight out of the block without having to release it, transferring the power-up straight to Mario or Luigi. A Roulette Block also appears in the Super Mario Bros. 3 Game Boy Advance remake, Super Mario Advance 4: Super Mario Bros. 3. It only appears in the level "Piped Full of Plants". It's very similar to the Super Mario World ones, but the Cape Feather is replaced by a Super Leaf. In addition, the item stops changing once released, and acts as if it was released from a Brick, Hidden, or ? Block. Roulette Blocks reappear in New Super Mario Bros., working as they did in Super Mario Advance 4. However, they become Empty Blocks when hit in this game, and the items scroll much faster. These Roulette Blocks can give Super Mushrooms, Fire Flowers, Super Stars, Mini Mushrooms or Blue Shells. Also, red Toad Houses contain giant blue Roulette Blocks (that contain the same items as the ones mentioned, besides the Super Star) which Mario can use to hold an item in reserve. The mid-level Roulette Blocks from New Super Mario Bros. also appear in the sequel, New Super Mario Bros. Wii. The blocks are yellow this time, and they contain items such as a Super Mushroom, 1-Up Mushroom, Super Star, Propeller Mushroom, or Penguin Suit. The next appearance of Roulette Blocks is in Super Mario 3D Land, as transparent glass blocks, like in Super Mario World. They can give Super Mushrooms, Fire Flowers, Super Stars, Boomerang Flowers (from World 5 onwards), and Super Leaves (replaced by Statue Leaves in the Special Worlds). Flying Roulette Blocks are also introduced, and can be found if Mario loses two lives in a row on a normal world course. These blocks return in New Super Mario Bros. 2, with the same design as in Super Mario 3D Land. They can give Super Mushrooms, Fire Flowers, Super Stars, Super Leaves, 1-Up Mushrooms, and Gold Flowers. In addition to the normal ones, gold numbered Roulette Blocks also appear, which produce coins instead of power-ups. When Mario hits the block, coins will pop out in the amount shown on the block when it was hit, either in single coins or 10 Gold Coins. The numbers that appear are 5, 10, 30 and 50, with 50 appearing only once per interval. Larger versions also exist, which can give 10, 50, or 100 coins (as a Giant Coin). In the Rainbow Courses, normal-sized coin Roulette Blocks only give 10, 30, or 50 coins. Roulette Blocks also appear in New Super Mario Bros. U with the same functions as before, though they retain their New Super Mario Bros. Wii designs. They can give Super Mushrooms, Fire Flowers, Super Stars, and Super Acorns. Roulette Blocks reappear in Super Mario 3D World with the same look as in Super Mario 3D Land. They can give Super Mushrooms, Fire Flowers, Super Stars, Super Leaves, Boomerang Flowers (from World 5 onwards), and Super Bells. Similar-looking Slot Blocks are introduced in this game in Lucky Houses, though they don't give items. Instead, they give coins depending on how many images are matched, from 10 (no matches) to 777 (four-of-a-kind) coins. A Roulette Block appeared in the Super Mario World television series in the episode "King Scoopa Koopa". After Princess Toadstool spots the Roulette Block and suggests that Mario should hit it, he hit the block and obtained a Cape Feather. These blocks reappear in Mario Party 9 in the Sock It to Lakitu minigame. Here the items are a Bullet Bill, two Bullet Bills, three Bullet Bills and a Spiny Egg. 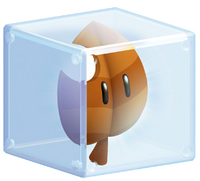 The Bullet Bills damage Lakitu while the Spiny Egg may damage the player. Roulette Blocks reappear in Mario Party: Island Tour in Bowser's Tower. They only appear after either making it to a certain floor or failing the same floor three times. A Roulette Block will then appear with one, two or three Mini Stars on it. Green Toad will then hit the block. The number of Mini Stars shown on the block will get rid of Bowser's minions in the next minigame. Getting three Mini Stars from the block skips the minigame entirely. In Paper Mario: Color Splash, three Roulette Blocks appear in the Spinning-Door minigame Blockstopper! Each block cycles through the following icons: a coin, heart, boot, hammer, Mushroom, and a question mark. After Mario hits one, he will receive a prize based on the icon displayed on the block; however, if Mario matches all three blocks, the prize will be multiplied. ↑ Nintendo Mario Mania Player's Guide. Page 46. This page was last edited on April 5, 2019, at 21:00.